Bob’s back. Landon’s still in LA. Gooch is on the bench. And Dempsey is the only forward getting playing time. Not much has changed since the World Cup. Though Captain America Carlos Bocanegra has started every match of the season for his new squad St. Etienne, his fellow World Cup defenders Oguchi Onyewu and Jay DeMerit have not been so fortunate. DeMerit, whose contract with Watford expired at the end of the 2009-2010 season, has yet to sign with a new club and Onyewu has not made an appearance for AC Milan. Unfortunately, it’s not just defenders who are failing to make an impact. Jozy Altidore, who led the US with 6 goals in World Cup qualifying, can’t seem to break into Villarreal’s starting XI. All three need to see the field prior to USA’s October friendlies against Poland and Columbia, lest they be dropped from Bob Bradley’s starting lineup. Bradley certainly will be concerned about each gringo’s lack of playing time, especially since there’s absolutely nothing he can do about it. Charlie Davies is the only prominent gringo suffering a lack of fitness. He hasn’t made a return to Sochaux’s 1st team, but Davies is seeing consistent minutes with the reserves. Given the continued absence of Charlie Davies – and his replacements’ failure to make any kind of impact – FFG has been adamant that Bob Bradley needs to adjust his 4-4-2. In an August friendly against Brazil, Landon Donovan, almost exclusively an outside midfielder for the US since 2007, started as a withdrawn forward. This switch to a 4-4-1-1 may have shown Bradley is ready to stop trying to find a Davies clone. 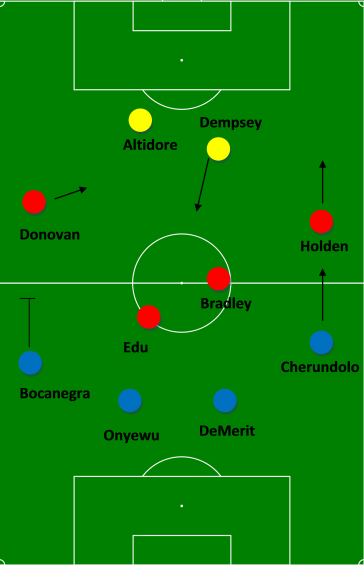 If he continues to use this formation, it’s likely that Clint Dempsey would operate as the withdrawn striker instead of Donovan (Dempsey was given a rest in August as his club was set to play their season opener a few days later). Stuart Holden and Benny Feilhaber are the players most likely to replace Dempsey in midfield. In modern soccer, maintaining possession is every manager’s top priority (Spain basically won the World Cup by playing keep-away). Dropping Dempsey towards the pair of central midfielders gives America an extra passing outlet yet keeps the Fulham man in a position where he can contribute when the ball advances up the pitch. As always, left back remains a source of contention. Carlos Bocanegra provides the best defensive cover (though his lack of pace can be exposed) but he offers very little going forward. If he grants any bonus to the attack, it’s that his limitations force him into a deeper role, allowing the outside midfielder freedom to roam without completely exposing the left flank. Look, Onyewu can’t cut it at Milan. They’re not going to let him go (for goodness’ sake, he’s going to play for free next year) and he’s only going to get on the field if someone else gets hurt, assuming that Onyewu is fully recovered from his 2009 injury. Oh, and Jozy is not nearly skilled enough to play in Spain. Boy needs to learn how to shoot. If I were Bob Bradley, there’s no way I would have renewed that contract. Even if Bob ever figures out that the 4-4-2 is dead at the international level, his players aren’t good enough to play anything else. It might take awhile for Onyewu and Altidore to be consistent starters for their squads, but given the deep runs their clubs make in almost every tournament they participate in, Jozy and ‘Gooch will get some playing time at some point. And when they do, Milan and Villarreal will realize the gringos shouldn’t have been on the bench in the first place. Come October, they’ll be a part of Bob Bradley’s tactical renaissance, as his 4-4-1-1/4-2-3-1 will roll through Poland and Columbia. I’d like to get Dempsey get more playing time at forward. With the way Fulham’s strikers keep getting injured, let’s just hope he stays healthy. But, man, Altidore and Onyewu seriously need to get some PT. Us common folk have absolutely no clue what type of shape/form he’s in.